In order to properly celebrate the legacy of Jerome John "Jerry" Garcia, I thought I'd post 8 different clips over the next 8 days, beginning today, his birthday, and culminating on 8/9, the anniversary of his death. This first clip, from the film Fillmore: The Last Days (2009), includes rare live footage of Jerry on pedal steel rehearsing with NRPS. There is a great quote from Bill Graham (included in the clip) who I think quintessentially sums up Jerry's mythic persona: "Jerry Garcia is the grand-daddy of them all...the big papa bear of what rock music should have been." And think, that was in 1971; time has certainly proved Graham correct. 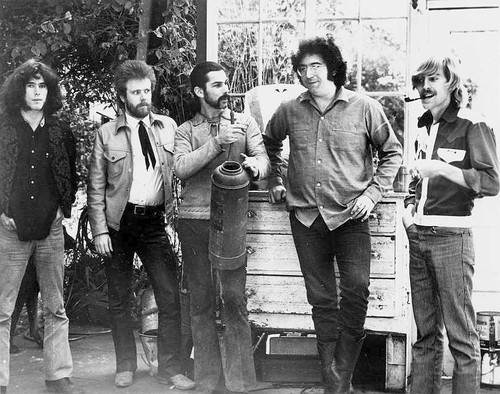 Quick history for those who don't know: Jerry was a founding member of the New Riders along with David Nelson and John Dawson (and very early on, Robert Hunter on bass and Mickey Hart on drums) with whom he played full-time until around 1971 when his responsibilities with the Dead became foremost priority. 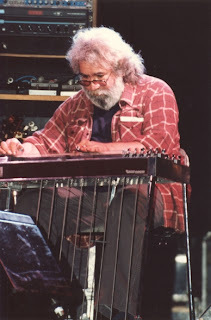 Despite his short-lived career with NRPS, it is Jerry's contribution on pedal steel and banjo that in my view, exemplifies not only his immense instrumental versatility, but even more, confirms his unsung influence on the then pioneering alt-country genre. Despite his parting with the band, Jerry continued to play on future NRPS albums and record for scores of other bands, as he was well-known for his skilled session work. Perhaps his most famous non-Dead contribution was for CSNY, for whom he played the haunting pedal steel part on "Teach Your Children." After a long hiatus, Jerry broke out the steel when the Dead toured with Dylan in 1987, a photo of which is included below.